At Smileworks Center, Tanya Melnyk, DDS provides veneers in our Ravenswood dental practice as a permanent solution to enhance the look of your smile. Veneers are made of porcelain, a tooth-colored material that is perfect for masking small imperfections and creating a uniform aesthetic. Contact our dental practice today to schedule your cosmetic dental consultation today! Our Ravenswood cosmetic dentist is dedicated to providing treatments that meet your specific smile goals. Veneers are a great option for patients with small, but numerous issues with their smile. Whether you need a veneer on a single tooth or multiple on the front row of your teeth, Dr. Melnyk will work with you to determine the best treatment plan for your smile. At the first veneer appointment, Dr. Melnyk will prepare your teeth to ensure veneers create a seamless appearance with your existing teeth. She then makes an impression of the prepared teeth. At this time, you and Dr. Melnyk will decide on the veneer shade that best matches your natural teeth. We recommend whitening surrounding teeth that aren’t receiving veneers to ensure an accurate shade match. Our Chicago dental office works closely with a trusted lab who creates the veneers from your custom impression. This usually takes one to two weeks. When the veneers are ready, Dr. Melnyk will place the veneers on your teeth. After any necessary adjustments, the teeth are cleaned and the veneers are bonded to the tooth. Porcelain cannot be whitened and good dental hygiene, including brushing and flossing, continue to be necessary. Be sure not to chew on ice or hard food items as this wears down veneers, and has the potential to damage them. 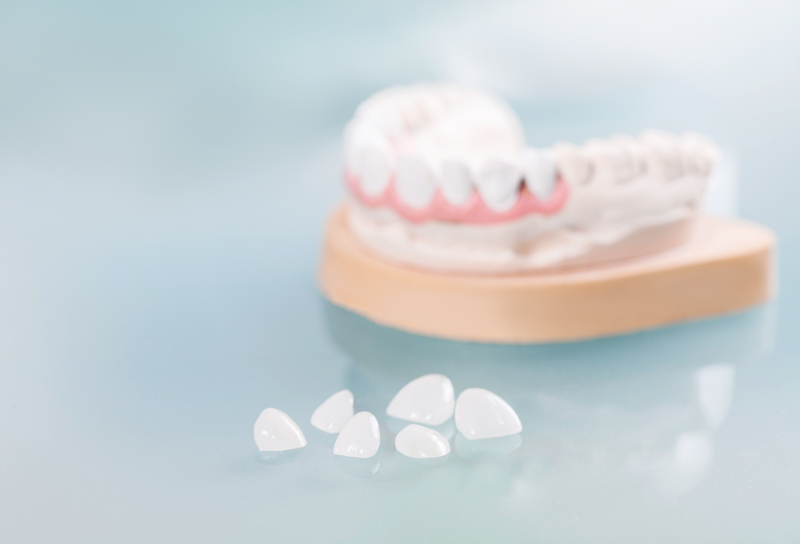 Imperfections such as chips, stains, and misshapenness can be solved with veneers. Dr. Melnyk provides veneer options in Chicago to patients looking for a uniform, healthy looking smile. Contact Smileworks Center to schedule your next cosmetic dental appointment. We proudly offer patients veneer treatment in Lincoln Square and Ravenswood.